It's What We Do For Ourselves! 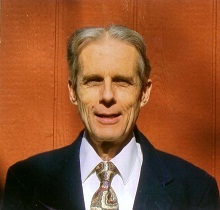 Hi, I'm Richard Ruhling, MD, a retired physician who taught Health Science at Loma Linda University after becoming board-certified in Internal Medicine. It wasn't easy, but I now see prescription drugs as a leading cause of illness, disability and death . I will share the medical literature to support this in the middle column (>>>) but first, let me tell you about the most overlooked cause illness and medical symptoms, both by doctors and people--it can be a food or chemical that we don't suspect! Let me give you an example. While in Executive Health, I had one executive says that sugar bothered his joints. Another said that cheese gave him joint aches. A third said meat was a factor in his arthritis. They were smarter than I was to figure out a cause to their symptoms. When I got headaches and couldn't see a relationship to what I ate or drank, I asked a neurologist who taught medical students, and he said, what I ate or drank would be a "very rare" cause of headaches. I later learned he didn't know. Most doctors don't know the cause of conditions in their textbooks that list most diseases as "Etiology [cause] Unknown." In my cases, I liked bread, pastry and pasta--I was overdoing it and it became toxic to me. I didn't listen to body signals like passing gas, and when headaches came, it didn't seem related to what I ate. The most likely time was Monday morning, but I hadn't been partying over the weekend, and I didn't hate my job--I couldn't figure it out. Though most allergists don't understand this, one wisely diagnosed my problem and it works like this. If you become allergiest to a food or chemical, it acts like a poison and you develop a tolerance to it, like to nicotine. And people don't get sick when they smoke--they get sick when they try to stop smoking, on withdrawal. That's the way my headaches were. Monday to Friday I took two sandwiches to work, but on the weekend we had oat waffles (not toast) and other things that gave me headaches as withdrawal symptom. Different people may get colitis, arthritis, gastritis from a food or chemical they don't realize is the cause of their symptoms. If you get symptoms and you don't know the cause and you don't take a prescription drug, suspect the possibility that a food or chemical is causing it. #1 suspect for many symptoms is caffeine as in coffee, tea or colas. If this could be you, scan the list of known problems by clicking on Caffeine at this link . Be Your Own Doctor ! Ruhling says cardiologists should have embraced Pritikin with information on how to get 85% of patients off blood pressure drugs, but their response was negative. They said he hadn't cured it because if people go off the diet, their blood pressure goes up. He adds that their response shows how broken the medical system is. Pritikin's Longevity Center reported 65 patients with triple vessel disease that had been scheduled for bypass surgery, but they went to Pritikin's center instead. Three years later, 90% never had surgery; and only one had died from heart disease. But in spite of these great results, Pritikin got no help from mainstream medicine, media or the heart association. A Harvard cardiologist told 60 Minutes that 90% of heart by-pass surgeries weren't necessary, and the US News (Aug 5, 1990) reported on Dean Ornish' center 15 years after Pritikin's report. Bill Clinton got the message and got on a low cholesterol, low fat diet from Dr. Caldwell Esselstyn at the Cleveland Clinic because with no change in diet, surgery, grafts and stints will soon plug up again. Dr. Lester Breslow, Dean of UCLA's School of Public Health, discovered in a 10-year federally-funded study that normal-weight people who did not drink or smoke had a 30-year advantage to those with an opposite profile that included exercise, 7 hours of sleep, 5 glasses of water daily--"happy" people who ate breakfast. Ruhling says millions of people have no appetite for breakfast because they ate late and they can't burn off the extra calories that get stored as fat. He says breakfast and mid-afternoon is the best times when people can eat more and not feel hungry when they go to bed, and their stomach can rest when they do. There are a wide range of chronic problems that we brought on ourselves by what we put in our mouths since childhood. If we were normal at birth and have problems now, we did it to ourselves, but this is reversible if we can discern the cause and eliminate it. I wasn't smart enough to figure it out for my headaches . I even asked the neurologist who taught medical students if anything I ate or drank could cause my headaches. He said that would be very rare for my type of [tension] headache. I later learned that he didn't know either! I loved pasta, pastry and whole wheat sandwiches and by overdoing it, became allergic, but I didn't get a headache when I ate them (two a day at work). I would get a headache after a weekend of other foods (oat waffles was a family tradition on Sunday) so that I was going through a withdrawal to a food that was a poison to me like nicotine that I had built up a tolerance to, just as people don't get sick when they smoke--they feel bad on withdrawal. That's an example of a wide range of symptoms from foods or chemicals. An example from executives I examined is one who said sugar bothered his joints. Another said cheese gave him joint pains. A third one said meat gave him arthritis. These were smart men, but most people who don't figure it out get a prescription that sooner or later brings trouble. It addresses the common problems and what we can do using natural remedies with a focus on foods and eating habits. It's only $2.99 in ebook on Amazon Kindle and they offer a free download for easy reading. It will be FREE Thursday, Dec 31 as a help for New Year's Resolutions! For twice the price you can get a truly excellent soft-cover that some physicians, myself included, say is the best book on health ever written. See the left column at http://ChooseABetterDestiny.com where you will also get a link to the online Encyclopedia of Natural Remedies. Here's a short video with reasons why prescription drugs are risky. Drugs will kill you or make you sick sooner or later, but most people aren't able to get out of the system by cutting down on their own. Congress is "dancing with the devil," says Marcia Angell, MD, in The Truth About the Drug Companies: How They Deceive Us, 2004, published by Random House. Angell says, "Drug companies promote diseases to match their drugs. Millions of normal Americans have come to believe that they have dubious or exaggerated ailments like 'generalized anxiety disorder,' 'erectile dysfunction,' 'PMDD,' and 'GERD." Government should get the drug ads off TV, but congress likes the $400 million that drug companies spend on their re-election campaign. General Accounting Office reported that for a decade, half of hundreds of drugs that were approved by the FDA had "serious post-approval risks, including heart failure, myocardial infarction, respiratory failure, seizures and kidney failure." Pharmaceutical companies do not do long-term studies. They don't want to know the results because they would be liable as tobacco companies were. But why do our tax dollars fund their research through NIH? And why do they get to push their drugs with TV ads? Pfizer's torcetrapib fulfilled its promise, increasing good cholesterol by 72% and reducing bad cholesterol by 24% in patients who were also taking a potent cholesterol-lowering drug. Despite the increase, the rate of potentially deadly heart problems rose by 25%, deaths rose by 40%. USA Today, 11-6, 2007. Meanwhile, scientists are discovering plant chemicals like lutein, lycopene and sulforaphane that protect against blindness, cancer, heart problems. What's the difference? Drug companies cannot patent natural products, so they focus on chemicals that relieve symptoms but do not cure. They are greedy and deserve to be taxed like tobacco companies to pay for the ever-increasing cost of medical care that their products cause. The government is pushing medical care as "healthcare," but there's an inverse relationship between medical care and healthcare , the more you depend on medicine, the worse your health will be. Drugs create illness due to Adverse Drug Reactions that now make medical care a leading cause of death. Journal of AMA, 4-15-1998. The article defines an Adverse Drug Reaction as from a drug that is "properly prescribed and administered." It's not an overdose or a bad prescription. It's just the way that patient reacted unexpectedly. But we should expect it --"Drug action always represents artificial interference with the natural functioning of the organism. In the widest sense of the word, every drug is by definition a poison, pharmacology and toxicology are one, and the art of medicine is to use these poisons beneficially. "** Drill's Textbook of Pharmacology in Medicine, Chapter 5: Intimate Study of Drug Action. Why are "pharmacology and toxicology...one"? Pharmacology evolved from toxicology, as it studied what dose of a chemical would kill half the animals and now we're doing with humans--it's just not reported in mainstream media as it should be because they like drug money. Half of the ads during evening news are for drugs. We have become a nation of druggies. "From 1998 through 2005, reported serious adverse drug events increased 2.6-fold...fatal adverse drug events increased 2.7-fold..." Archives of Internal Medicine, Sep 10, 2007, p 1752. But if deaths increased 2.7 fold from 1998 to 2005, by 2013 they are increased 5.4-fold. Multiplying 305,000 deaths/year by 5. 4, prescribed drugs killed 1.65 million people/year-- these are not old people in nursing homes--most of them weren't even in the hospital. 1,650,000 deaths/year is 4500 deaths daily--like one and a half 9-11's daily! Confronted with these figures, a U.S. Senator said told me I was wasting my time, "they own us," referring to the pharmaceutical industry that spends $400 million/year on congressional re-election campaigns, says (Marcia Angell, MD, former editor of New England Journal of Medicine (60 Minutes' interview), now teaching at Harvard. These people are false to their oath of office. 1. Drugs relieve symptoms and people think everything is okay. You don' t have to be as careful what you eat. Your blood sugar, blood pressure or cholesterol will still be "normal." 2. Drugs do not cure disease. If they did, you wouldn' t need another prescription. 3. Drugs usually have a long list of adverse effects that people would not imagine. 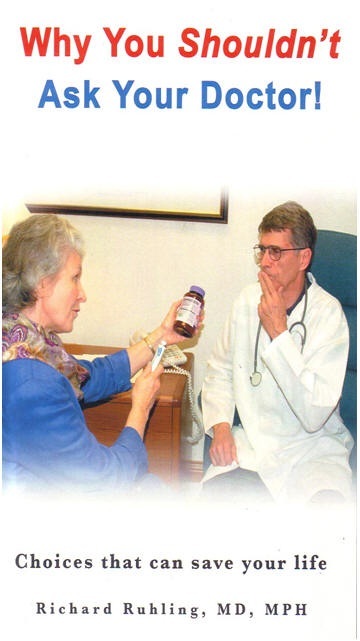 A purple pill (the ad said, "heal the damage") has 120 adverse effects in the Physician's Desk Reference. 4. Our bodies don' t have a chemical deficiency supplied by the drug, and they become toxic to it sooner or later. Then they go to their doctor for the 'headache, diarrhea, or abdominal pain' for an additional prescription instead of quitting the one that caused it. They are now at risk for the leading cause of death, prescription drugs. The problem is that we need medical care for emergencies, trauma and childbirth, and most people think any serious pain is an emergency need to see the doctor, even though, if you hit your thumb with a hammer, it will be ok even without seeing a doctor. Marcia Angell, MD, former editor of the New England Journal of Medicine and author of The Truth About the Drug Companies: How They Deceive Us and What to Do About It, decried the drug ads in the media. She told 60 Minutes 10+ years ago that drug companies spend $400 million on congressional re-election campaigns; by now it's a billion? A US senator, confronted with medical literature that drugs are a leading cause of illness and death told this author, "You are wasting your time. They own us!" **We might wonder how or why a doctor "might use these poisons beneficially," but if a person's blood pressure is sky-high from eating chittalings (hog intestines), it's better to take a drug to get the blood pressure down than to have a stroke (burst blood vessel in the brain resulting in paralysis). Nathan Pritikin reported to the American College of Cardiology that 186 of 218 patients got off their drugs for blood pressure with a low fat diet because a high fat diet makes rouleaux (blood cells become sticky and the heart has to pump harder to circulate the blood). The World Health Organization reports, "the number of people with uncontrolled hypertension rose from 600 million in 1980 to nearly 1 billion in 2008 [and is] positively and continuously related to the risk for stroke and coronary heart disease." The government can't run the postal system profitably in spite of 49 cent postage instead of 3 cents 65 years ago, but they want to run medical care that's far more complex! They want it because too much money is involved--they can't keep their hands out of the pot. Ruhling thinks his ill-health as a child was due vaccinations and mercury dental fillings; he changed his diet in college and has only had one prescription in his adult life. His last hospital insurance was purchased 40 years ago to cover the birth of their youngest son. Why should we be taxed to cover the medical costs of those who want to eat, drink and smoke as they please? Our medical system evolved to accomodate fast patient visits with a prescription that addresses the symptom.. Most people decline to change habits as long as we have free government "healthcare." It's a great society until the half who pay the pill bills can no longer afford a 2nd indulgent half, but maybe economic reality is dawning? Every nation using western medicine is on the brink of bankruptcy because drugs don't address the cause which is usually our misdoing, says Ruhling, adding that true healthcare builds wealth while medical care invites ruin. Ruhling say he called General Motors to offer his healthcare program circa 2005, but they said they had things under control until bankruptcy later due to retiree healthcare costs. Ruhling offers a wellness program to companies to cut healthcare costs by employees opting out of the government plan. ""Far too large a section of the treatment of disease is today controlled by the big manufac turing pharmacists, who have enslaved us in a plausible pseudo-science...We take into our bodies which we know little about, drugs that we know less about, to treat diseases that we know nothing about." The Bible foretold what's happening: "Babylon is fallen...for by her sorceries [pharmakeia is the Greek word] were all nations deceived" Revelation 18:2,23. Dr. Ben Carson said, "Obamacare is the worst things for America since slavery!" 1. Obamacare is medical care that has high risk of illness, disability and death from drugs as on this page. 2. Obamacare will be linked to a National ID Card. This infringes on our privacy. They will know who we are, where we are, how much money we have in the bank and how to take it--pg 58. Download the Ebook for $5.95 and get five PDF's on Natural Remedies as a bonus. These were prepared for wellness programs given to public and industry. Can you see how impossible it would be to build your bones by drinking more milk when you are on a high protein diet? Many Asians, Indians and Black people have a lactase deficiency and can't digest lactose (milk sugar), so they don't drink milk, but they have less osteoporosis than caucasians who do! **Note: After making payment, please select Return to Total Health to get your downloads. Vaccinations: Who Said They Are Safe? You can read the very best article on vaccinations that I've found on this at http://www.wnd.com/2015/02/how-vaccine-hysteria-could-spark-totalitarian-nightmare/ but since you are already here, scan below and compare because some info here isn't in the above article. If children receive flu vaccine, it can be even more deadly because children are more sensitive to mercury and to the effects of depressed immunity. Flu vaccine in children causes an increased incidence in asthma by 200%. There has caused sudden memory loss in children and adults immediately after receiving flu vaccine. . Very young babies are at extremely high risk because their brains are immature; blood brain barriers are 'leaky' and more sensitive to toxins. In the first two years of life, infants may receive 22 vaccines with as many as nine shots in one office visit. Many doctors feel this is criminal. The vaccination schedule is at 2 months, 4 months and 6 months. Japan sees the problem and has much fewer adverse incidents by waiting a year before vaccinations. Nasal flu vaccines are even worse because they introduce a live virus into the nasal mucous membranes only a few inches from the brain where viruses can potentially travel upward via the olfactory (smell) nerves. The evidence is overwhelming: Thimerosal and possibly other ingredients can cause autism. On February 25, 2008 an announcement came that even the Court of Federal Claims (the Vaccine court) agrees, as a family was awarded compensation from government (Dept. of Health & Human Services via US Assistant Attorney General Peter Keisler), in the case of a little 18 month old girl who immediately began a downhill neurologic horror shortly after receiving vaccines for 9 diseases in one visit to the doctor's office. Two of the vaccines contained thimerosal. Vaccines aren't just prone to produce autism; they have the potential to produce a variety of brain damage syndromes, mild to severe, depending on several factors embodied within the genetic + nutritional + environmental variables. Cleverly worded distortions in official press releases illustrate simply more ways that 'lying with authority' can fool you. SHOULD ADULTS RECEIVE ANNUAL FLU SHOTS? It is estimated that a flu vaccine injection yearly for five years running increases the chance for Alzheimer's by at least 1000%. Flu vaccine can also cause anxiety and depression preceded by brain inflammation especially in the elderly who have high suicide rates. In spite of these known risks with vaccines, there is an all out campaign by public health officials and doctors to vaccinate elderly people, not only with the flu vaccine, but with a growing number of new vaccines. Many people report that flu shots give them the flu. In fact, people die from flu vaccine. When the elderly die after getting a flu shot, especially if months later, it is rarely blamed on the flu vaccine. Deaths and disability from flu vaccine far exceed deaths from the flu. . . Flu vaccines are only effective in 30% to 40% of people who take them and even that is questionable. There has never been strong evidence of fewer hospitalizations or decreased death rate from taking flu vaccines. This is another example of fact distortion by authority in the effort to sell more flu vaccine. Flu vaccine during pregnancy can dramatically increase the risk for autism and schizophrenia. Most flu vaccines contain mercury (thimerosal) and aluminum and could contain viral fragments. It could cause multiple side effects in the brain including paralysis, hearing loss, vertigo and brain irritability. Flu vaccine over-stimulates the immune system. It can suppress immunity for weeks after receiving the vaccine. . . In people who die from flu vaccine, and there certainly are a number every year, the actual cause of death has often been reported as due to some other type of disease, but in reality, their immune systems have been depressed, allowing other diseases to become more deadly. An easy example is the flu--a costly problem if an employee goes to the emergency room (average cost is about $1,000) to get an antibiotic, though there's no evidence this kills viruses. "The flu takes a week if you have the right medicine, and 7 days if you don't." Well, it really depends on us and what we do to overcome it. First of all, how did we get it? The flu season begins in cold weather when some people don't dress well and they "catch cold" because when our extremeties are cold, vasoconstriction to conserve body heat forces blood to the head and chest and makes congestion. Secondly, we get the flu when we have been indulging our appetite with sweets from Thanksgiving to Christmas to Valentines Day and Easter with chocolate bunnies or Christmas candies. Sugar lowers our immunity when fresh fruits and summer berries aren't so available. Some add to their misdoing by getting a flu shot. The evidence that it helps prevent flu is lacking and I had a nurse tell me she lost a week of work after getting one. Mercury is a toxic poison used as a preservative in multi-dose vials of vaccine. This highly toxic substance is used on infants whose immune system is not well developed. Let them do it on their own kids, but why allow the government to force it on others? The video was on YouTube but got pulled (drug company pressure?) The truth must be known, "no vaccine, no autism." If we lived well, we shouldn't need vaccines. Here's an excerpt on Immunity from a Health Ebook that I wrote. If you like this info, you may want the ebook along with a collection of PowerPoints made for company employees on different topics. The body has an amazing ability to resist disease. All around us are germs�bacteria, molds and viruses. six teaspoons of sugar. That sounds like more than weever get until we realize a can of soft drink has 9�12 teaspoons and the average American gets 35 teaspoons daily! It is no wonder that we suffer a flu epidemic every winter after the holiday season. It�s a miracle we do as well as we do. Having worked with high exposure to "the bug" from patients, here are some practical tips that have helped me. 1. Upper respiratory infections are mostly caused by viruses and no medicine is effective in killing these types of germs. Remedies focus on helping symptoms or strengthening body immunity. 2. Because of TV advertising, many mothers get nervous about children�s fever and zealously treat any temperature over 100 degrees. Actually fever is the body�s own mechanism to fight the infection! Simply giving fluids is best in most cases. unless the temperature is over 104 or there is concern about seizures (usually in infants who haven�t had enough fluids to drink). Giving Tylenol, aspirin or Advil to lower fever works against the immune system, because many viruses are inactivated at 102 or 103 degrees. 3. Fluids should be nondairy and non-sugary because milk makes mucus and soft drinks lower the white blood cell�s ability to phagocytize (eat) germs! Children may be taught to drink water by good examples and by weaning them from sweet drinks by diluting fruit juice more and more. Water is an essential ingredient for our bodies. We should to drink five to eight glasses daily! 4. Sore throat? The best remedy is a charcoal tablet allowed to dissolve on the back of the tongue. Science documents the adsorption of viruses by activated carbon. The tablets are soothing, inexpensive and useful for medical problems, including allergies, indigestion or food poisoning, gas and diarrhea. Animal studies in Russia suggest longer life span. The reason you don�t hear about charcoal�s benefits is because there is little commercial profit! Agatha Thrash, M.D. has written a 90-page book on its many benefits. 5. Much discomfort comes from sinus infection. Drinking water and eliminating dairy products (which make phlegm) is helpful, but the most important tip is NOT to blow the nose because germs from the throat are blown up to the sinus opening and infection is introduced by blowing! Do the opposite to clear sinuses�sniff to �draw secretions from sinuses down to back of throat. 6. No fever? Help your body mobilize its defenses by soaking in as hot a tub bath as you can stand for 20 minutes, I have been able to raise my temperature to 102.5 from normal by doing this. Finishing off with a cold pour or shower can increase your white blood count and further stimulate your immune system. If you don�t eat, your white cells will be even more hungry to "eat" germs. I have found this technique can get rid of flu symptoms overnight, but it works best if you will institute the above measures when you first realize you are coming down with it. Do not take drugs designed to mask symptoms. They interfere with the body�s mechanism. I have seen countless patients in clinic or emergency rooms who have taken all that stuff for a week and wonder why they aren�t better. The IRS says the cost of insurance for a person is $20,000 and for a family of four, it's about $22,000. That's not affordable with the economy in the ditch. For 30 years, wellness programs have helped companies save money by helping employees to stop smoking or drinking, lose weight, avoid by-pass surgery or the Emergency Room for flu.